With sleek, angular lines and soft edges, this Ashlyn 1-Handle Pressure Balance Shower Faucet Trim Kit Only in Chrome (Valve Not Included) creates a modern appeal at an attractive price. Delta is committed to supporting water conservation around the globe and has been recognized as WaterSense Manufacturer Partner of the Year in 2011 and 2013. Getting ready in the morning is far from routine when you are surrounded by a bath that reflects your personal style. Item Boxed Weight: 1.7 lbs. 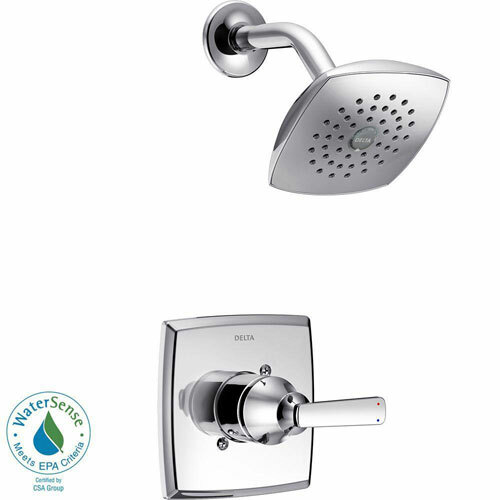 Buy this Delta Ashlyn 1-Handle Pressure Balance Shower Faucet Trim Kit in Chrome (Valve Not Included) 685375 Now!